We had wonderful guests from Brazil in the Osaka Class. She hasn't lost her sense of ikebana. 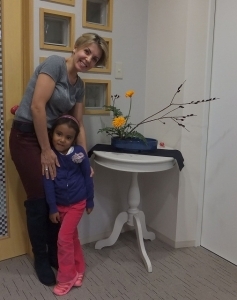 She brought her daughter who is proud of her mother very much saying 'My mom makes a beautiful ikebana! ':)　Wishing the family blessed in her country! 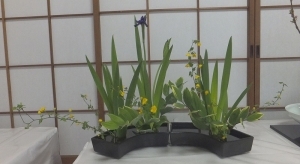 Hiroshima Toshogu Shrine held a spring festival, and some from my class offered ikebana arrangements as we do every year. 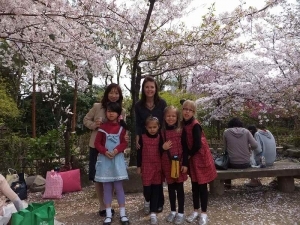 The place was filled with spring fragrance of flowers displayed. This was the last class day for a German lady Mar. 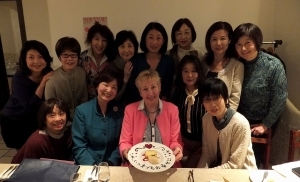 and we had a farewell lunch together. 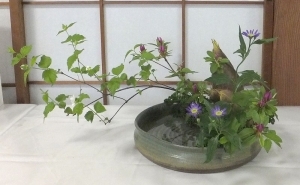 She had been in my ikebana class for 11 years. 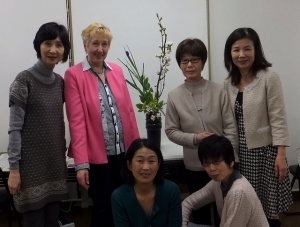 Her warm and serious attitude toward plants makes her arrange a beautiful ikebana arrangement everytime at the class. She concentrates in arranging when working during the lesson, and then she enjoys chattering with us at a coffee time. She is a bright and warm lady, and is loved by everybody. All of us will miss her a lot! 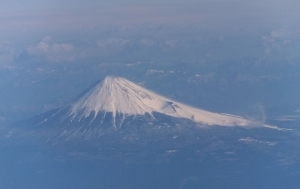 Mt.Fuji through the airplane window from Hiroshima to Narita in March. It was snowy morning and the sky was very clear. 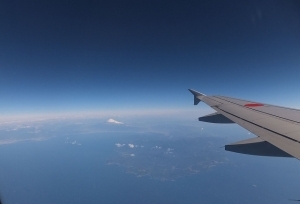 I could trace the figure of the Izu peninsula clearly. 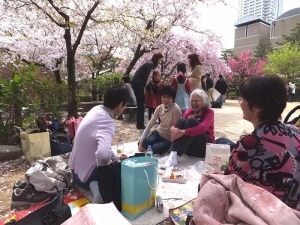 On Thursday April 3, we had an anual cherry blossom viewing picnic from the Hiroshima ikebana class at the Shukkeien Garden nearby. Cherry flowers were in the most beautiful timing, with fresh tiny green peeking. Some pink petals were fluttering in the light spring breeze. Lunch was very tasty with a little wine. 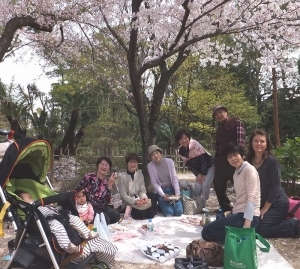 Some foreign friends joined us, we sang 'Sakura' song together. In our group photo, I found someone we don't know! He must have joind us from the next group to us. We had a wonderful time anyy! Thanks everybody!